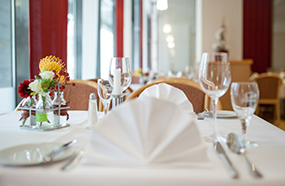 Enjoy a Christmas buffet in the restaurant of the Luther-Hotel every Wednesday with your friends or colleagues. Enjoy a special New Year's Menu and a night to remember with live music and delicious treats at the Luther-Hotel! Your kitchen will stay clean, because you will get the finished goose feast, classically prepared with red cabbage and green cabbage, potato dumplings and mugwort jus in your own four walls. 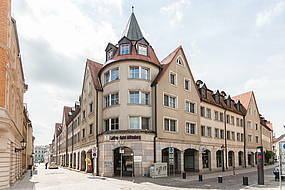 The restaurant in the Luther-Hotel delights its guests again and again with lovedly prepared meals, exquisite wines and its hospitality. The culinary highlights, which are offered throughout the year, are the right thing for every connoisseur! Here, gourmets will find all the regional and seasonal offers which kitchen director Christian Hirsch has in store, but also little highlights that make the year a varied culinary delight! Whether as a starter, snack or main course - pumpkin is a real talent and treat. Look forward to some creative interpretations of the healthy autumn vegetable! *Please reserve the table in advance.